Helix Jump Game: Exciting adventure of the bouncing ball through the helix tower labyrinth. One-tap easy-to-learn controls, rich visual effects and addictive gameplay mechanics. 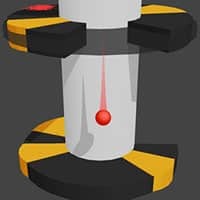 Helix Jump Game allow you to test your reaction skills by spinning the helix tower labyrinth allowing the red ball to pass. Avoid orange tiles unless you have enough falling momentum to smash through it. It is a fun game can help you kill time. When you are boring at bus station or waiting for Que, you can always open this game and have a good time. Good luck. Helix Jump Game is one of our Action Games at Round Games. It is also tagged as a skill and avoid game. To play even more free games, view our most played and all games pages. If you want to play more games like this game: Then you can simply check out the games inside the game tags that are the most relevant to your interests or check the Action Games category or check the related games section at the end of the game page. Also make sure to check out Helix Run Game, you may enjoy playing it.